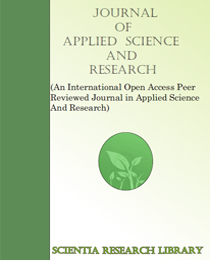 Journal of Applied Science and research aims to publish original research articles, review articles and short communications in all aspects of applied science including applied sciences like Chemistry, Botany, Physics, Zoology, Biotechnology, Microbiology, Geology, Geography, Anthropology, all Engineering Sciences and Medical sciences, Agricultural & Soil, Animal & Veterinary, Biological, Forensic, Marine, Petroleum & Gas, Pharmaceutical, Polymer, Medical, Biomedical Materials, Chemical Physics, Computational Chemistry, Food & Food Industry, Marine Technology, Medical Technology, Medicine Research, Nanotechnology, Synthetic Drugs, Textile Industry & Fabrics etc. Institute for Complex Systems (ISC), CNR and Department of Physics Universita` degli Studi "La Sapienza"
Scientia Research Library publishes all its articles ( research papers ) in full open access format which are easily accessible for scientific community. 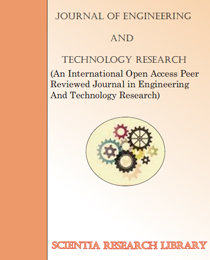 Researchers have free and unlimited access to the full-text of articles published in Scientia Research Library Journals i.e, Readers can access the published articles freely without login and password. 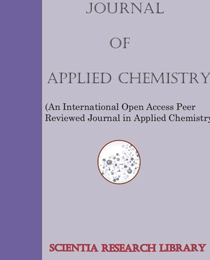 It gives the author’s research high visibility, availability and more citations.